Thanksgiving is quickly approaching in Canada (Oct. 13, 2014), so you (like us) have likely been scouring your old cookbooks and Pinterest boards to find the best possible recipes to serve family and friends. Whether you're hosting a massive shin-dig at your house or contributing to a potluck, you want your selection to stand out. So if you've agreed to be the one who brings the pumpkin pie, we have options for you. Depending on your crowd, you can either go classic, or get a little creative with how your pumpkin is served. We've pulled together 20 ideas for adding that dose of orange to the table, whether it's encased in a spectacular crust or ready to be gobbled in fudge form. 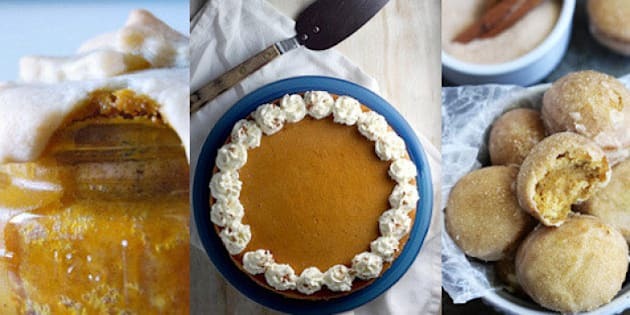 Check out these ideas for pumpkin pie this Thanksgiving along with other pumpkin desserts that will satisfy any sweet tooth.